Featuring Aaron Adams as John Wilkes Booth, Jason Bowcutt as James Buchanan, Dee-Dee Darby-Duffin as Harriet Tubman and Emilie Starr as Emilie, your host. Playwright Elaine Jarvik has previously premiered RIVER.SWAMP.CAVE.MOUNTAIN. (2017), BASED ON A TRUE STORY (2016) and MARRY CHRISTMAS (2015) at Plan-B Theatre. Other plays include TWO STORIES (2014) and A MAN ENTERS (2011) at Salt Lake Acting Company; and THE COMING ICE AGE (2010) at PYGmalion Theatre Company. She is a former newspaper reporter and a current drummer with the band The Distractions. Aaron Adams [J.W.] returns to Plan-B for the first time since SLAM and the Script-In-Hand Series reading of COLD in 2006. Recent credits include MERCURY (SLAC), PICNIC and A VIEW FROM THE BRIDGE (Grand) and ION (Classic Greek Theatre Festival). Other credits include Shakespeare & Company, Radical Hospitality Theater, Westminster Players, Pinnacle Acting Company and Black Dog Productions. BFA, Acting, U of U.
K.L. Alberts [Costume Design] is happy to be working with Plan-B again having designed THE ICE FRONT last season. For the past 31 seasons, he has worked with Pioneer Theatre Company, where his favorite designs include LES MISERABLES (regional premiere), THE PRODUCERS and LAUGHING STOCK (world premiere). For Utah Shakespeare Festival he has designed BIG RIVER, GUYS & DOLLS and AH! WILDERNESS, among others. While living in New York, Kevin worked on, off and far away from Broadway and for the Ralph Lauren Company. Jason Bowcutt* [James] Is thrilled to be back at Plan-B, where he has previously acted in BASED ON A TRUE STORY and THE END OF THE HORIZON and directed ONE BIG UNION, ADAM & STEVE AND THE EMPTY SEA and MARRY CHRISTMAS. Other work includes directing FUN HOME for Salt Lake Acting Company, THE OTHER PLACE and [title of show] for Utah Rep and WELL for PYGmalion Theatre Company. He spent years working as an actor/director in NYC and theatres across the country. Cheryl Ann Cluff [Director/Sound Design] co-founded Plan-B in 1991 and has served as Managing Director since 1995. She has designed sound for nearly every Plan-B production since 2000 and directed all 13 episodes of RADIO HOUR. Cheryl Ann’s recent directing credits include Jennifer Kokai and Oliver Kokai-Means’ ZOMBIE THOUGHTS and Elaine Jarvik’s RIVER.SWAMP.CAVE.MOUNTAIN. and BASED ON A TRUE STORY. Dee-Dee Darby-Duffin [Harriet] returns to Plan-B, where her credits include THE THIRD CROSSING, NOTHING PERSONAL, MAMA, THE EDIBLE COMPLEX, (IN)DIVISIBLE and THE WEIRD PLAY. Her short play “DOLs” was read as part of the Script-In-Hand Series a few weeks ago. The present is this body of work right here. Be present. Thomas George [Scenic Design] returns to Plan-B, where he has previously designed VIRTUE, BASED ON A TRUE STORY and KINGDOM OF HEAVEN. He holds an MFA from UCSD and a BFA from the U of U, where he currently teaches Set Design. Recent local credits include A FUNNY THING…, SURELY GOODNESS AND MERCY, CLIMBING WITH TIGERS and STUPID F*CKING BIRD (SLAC), RED BIKE, SILENT SKY, MARY AND MYRA, SELMA ’65 and MOCKINGBIRD (PYGmalion) and, BIG LOVE, THE BEAUTIFUL GAME and DOGFIGHT (U of U). Catherine Heiner [Dramaturg] is delighted to be back at Plan-B! Earlier this season she worked as rehearsal stage manager for GOOD STANDING and acted as reader/stage manager for the Script-in-Hand Series reading of DONNA . Her dramaturgy credits include THE LION IN WINTER (PTC) and THE WOLVES (SLAC), as well as SELF DEFENSE, OR DEATH OF SOME SALESMEN and AMERICAN IDIOT (U of U). Analysha “Skip” Mulcock [Stage Manager] is excited to make her Plan-B debut after taking a year away from the entertainment industry to work in law enforcement. She is glad to be back doing what she loves and would like to thank her family and loving partner for their support. Select stage management credits include THE ROCKY HORROR SHOW and THE LAST FIVE YEARS (Grand) and A FLEA IN HER EAR (U of U). Arika Schockmel [Prop Design] has worked extensively in props and costume crafts for theatre, television and film. Her Plan-B designs include CHRISTMAS WITH MISFITS, VIRTUE, THE WEIRD PLAY and ZOMBIE THOUGHTS. Arika is in her fourth year as the resident Prop Master for the Department of Theatre at the the U of U and has propped, crafted and designed regionally for Park City’s Egyptian Theatre, Utah Festival Opera & Musical Theatre, Grand Teton Theatre, Dark Horse Company Theatre, Salt Lake Acting Company, Utah Contemporary Theatre, Lyric Repertory Theatre Company. Member, Society of Prop Artisan Managers. For Charlotte Rose. Emilie Starr [Emilie] is excited to work with Plan-B once again, having been seen previously in THE ICE FRONT and VIRTUE. Other recent credits include MR.PERFECT, R&J: STAR CROSS’D DEATH MATCH and DIARY OF A WORM, A SPIDER AND A FLY (SLAC). When she is not on stage, Emilie works as an executive assistant for Utah Division of Arts & Museums and is the host of tBYU-TV’s Random Acts, currently filming its fourth season. Plan-B Theatre Company develops and produces unique and socially conscious theatre and has produced nearly 100 world premieres by local playwrights since 1991. 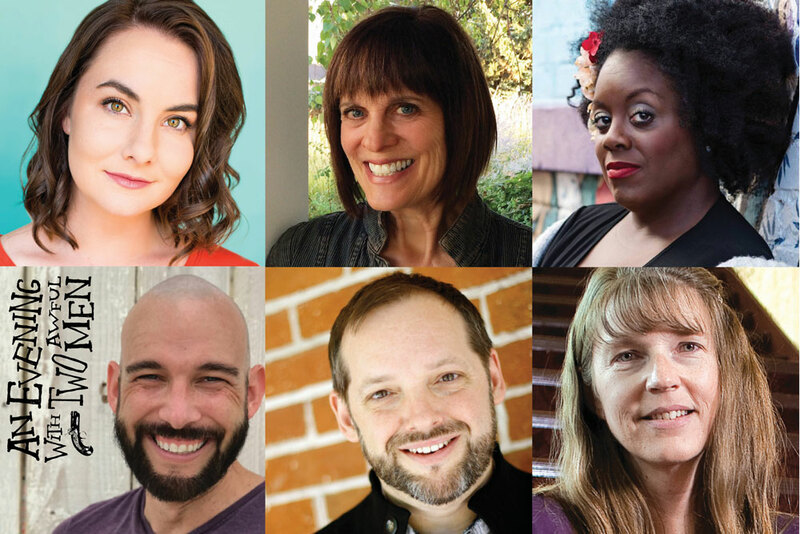 Five of those have been nominated for the American Theatre Critics Association/Steinberg Award for Best New American Play Produced Outside New York, five have enjoyed extended lives in New York, two have toured internationally and two have been nominated for the Pulitzer Prize for Drama. Awards include Human Rights Campaign’s Equality Award, Equality Utah’s Allies for Equality Award, Transgender Education Advocates of Utah’s Organization of the Year Award (twice), International Center for Women Playwrights’ 50/50 Applause Award (thrice), a PAAL Award, Utah’s Governor’s Organization Leadership in the Arts Award and Salt Lake City’s Mayor’s Artist Award for Service to the Arts by an Organization. Plan-B is the only professional theatre company in the United States producing full seasons of new work by local playwrights. Designed by K.L. Alberts (costumes), Cheryl Cluff (sound), Thomas George (set), David Rees (lighting), Arika Schockmel (props). Stage managed by Skip Mulcock. Dramaturgy by Catherine Heiner. Directed by Cheryl Cluff. From the author of RIVER. SWAMP.CAVE.MOUNTAIN, BASED ON A TRUE STORY and MARRY CHRISTMAS and contributor to (IN)DIVISIBLE. Funded in part by the Arch & Bruce Brown Foundation. Click here to follow Dead People Live! on Twitter. Please join us online Tuesday, November 27 for a 24-hour day of giving to support the only professional theatre company in the entire country producing full seasons of new plays by local playwrights (hey – that’s us)! We feel a responsibilty as a company to reflect the community in which we live. And yet I’ve been asking myself: with all that is happening, does attending the theatre even matter?